The venue was the famous Old Course at St Andrews, the date was Friday September 23, and the drive was the first act of the retired solicitor’s year as captain of the venerable Royal and Ancient Golf Club. The R and A, as it is known to everyone in the sport, was founded on 14 May 1754 with the first Challenge for the Silver Club. From the late 19th century, the club increasingly came to be regarded as a governing authority for golf, both at home and abroad. Between 1897 and 2003 it developed three distinct areas of responsibility — the administration of the Rules of Golf in conjunction with the USGA, the running of The Open and other key golfing events, and the development of the game in existing and emerging golfing nations. 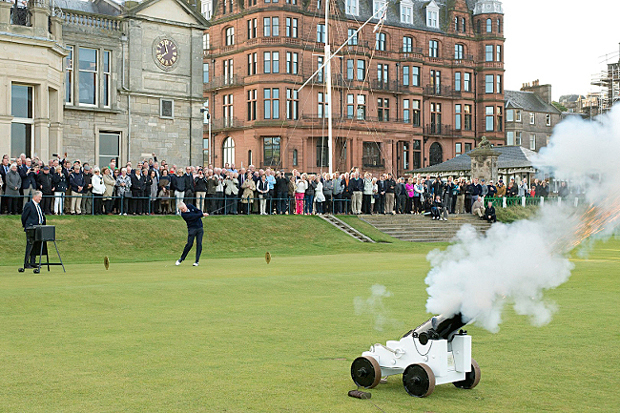 A major reorganisation in 2004, however, saw the club devolve responsibility for these functions to a newly-formed group of companies, known as The R & A. Today the club aims to be a members golf club with a clubhouse with high-quality facilities and access to first-class golfing, to maintain the position of St Andrews as the Home of Golf, to provide temporary accommodation for members and others, and to acquire and preserve records and artefacts relating to the history of the game. For the next year Keith, who in his youth was one of Scotland’s top amateur players, will be the public face of the R and A, and he was very excited. He said “As well as being excited, I am a little intimidated, I think, to start with! “Having regard to not just the work involved and the nature of it throughout the year, but also the people who have done it before and made a very good job of it, it is intimidating. With a very successful legal career behind him and as a highly competitive golfer who became Scottish amateur champion in 1979, the former Cardross Primary School and High School of Glasgow pupil seems very well qualified for a most demanding post. “I won’t run anything or have anything to do with the management of the club or the company’s business,” he said, “but I will go to a lot of dinners! “The county golf unions, largely in England, and other golf clubs want the captain of the R and A to come and say a few words. “There is a lot of this, and the events come quickly — I have 13 speeches to do by the middle of December, and there are more than 50 over the year. “At five of the dinners and possibly more there will be an overlap of people, so I cannot just top and tail the same material! “I have approached the job on the basis that my normal life is scrubbed for the year, and if I can manage a couple of golf events which are not R and A that will be good. “Even if I have a week of a gap, I will be recovering from jet lag and preparing the next few speeches probably, so there won’t be much time for anything else. “There are plenty of people who come along and say ‘before you go to the Masters, why don’t you come to Florida and play a few rounds of golf and see people and go to cocktail parties. His global ambassadorial role will mean many trips abroad, only some of them with his wife Diana, the well-known local organiser for the Save the Children Fund. He will be away home at some time in ten out of the next twelve months. His first trip is to Korea in October as the R and A, along with Augusta National, have founded the Asia Pacific Amateur Championship. Next he and his wife are going to Australia to meet up with Australian members of the R and A who have their own competition there in October in which he will take part in. In the 1970s and 80s, the name of Keith Macintosh seemed to come up almost every week during the summer, as he won, or came close to winning, many amateur tournaments. 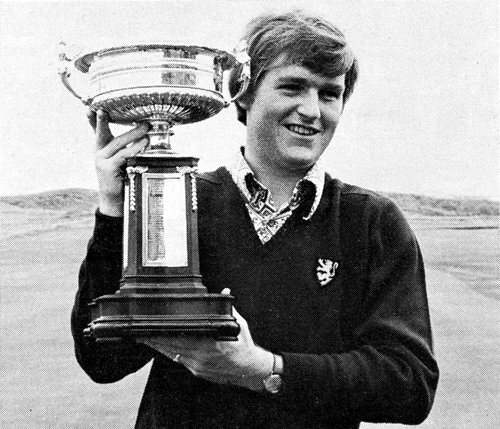 Among the highlights were winning the Scottish Amateur Championship in 1979 (pictured), winning the Belgium Open Amateur Championship in 1980, representing Scotland in 1979-80, being a member St Andrews Trophy team for Great Britain and Ireland against Continent of Europe in 1980, and winning the Royal and George Glennie Medals in 1999 and the R and A’s Bombay Silver Medal in 2004. He has never shirked from taking office in golfing and other clubs and societies. An honorary member of Cardross Golf Club, he is a past captain of the 32 Club, which is a West of Scotland-based golf club, past captain and secretary of the Glasgow University Golfing Society, past captain of Glasgow High School FP Golf Club, past captain of the Scottish Universities Golfing Society, and past secretary of the Society of Scottish Golf Internationalists. Chairman of the Prestwick club in 2013-14, he has already served on two R and A committees, Amateur Status from 2003-7 and Finance from 2010-14. He graduated LLB from Glasgow University in 1971, then served as a legal apprentice at Mitchells Johnston Hill & Hoggan, Solicitors, Glasgow from 1971-73, then assistant at Macintosh Humble & Co, Solicitors, Dumbarton, from 1973-77, becoming a partner from 1977-87. He was company secretary of the Clydesdale Bank PLC from 1987-96, then had a year as a partner at T.C.Young & Son, Solicitors, Glasgow. He joined the local firm of McArthur Stanton, Dumbarton and Helensburgh, serving as a partner from 1997-2005 and consultant from 2005-9. Throughout his career and since retirement he has been involved in many West of Scitland organisations. 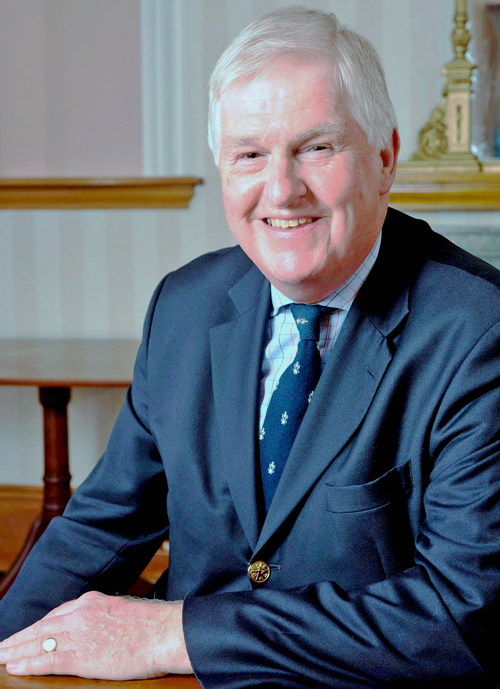 He is a past chairman of Glasgow’s Western Club, past president of Dumbarton Burns Club, president of Dumbarton Rotary Club in 2007-8, past secretary and current Parent Fish of Dumbarton Salmon Club, and Deacon of the Incorporation of Bonnetmakers and Dyers of Glasgow in 2000-1. He is a noted public speaker who is both erudite and humorous, and this was probably one of the considerations when the past captains of the R & A met last September and December to select the next captain. Now his year in office has started with the traditional ceremonies on the last day of the Autumn Meeting. When he hit his drive a cannon was fired. After hitting his tee shot, the new captain said: “I was a little more relaxed on the driving range than I was there. I was a bit quicker there but I won’t tell anyone where I was aiming. “The caddies all run down the fairway after the ball, and the caddie who got the ball, John Boyne, sold it back to me for a gold sovereign. Then there was a breakfast with past captains and wives, and I played a normal medal round after that. “There used to be a competition among several members for the Queen Adelaide Medal which was awarded to the winner who became captain. But since the early 19th century the only person who plays in the competition is the person nominated to be the new captain and he wins the medal by hitting the one drive. New R and A captain Keith Macintosh drives off.